← We believe that we will Do the Thing! Erin and I have a fun thing up at The Snarkology today. 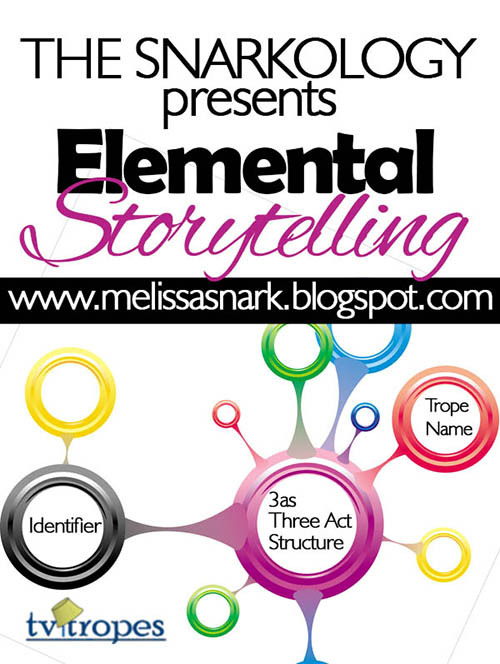 Melissa got permission from TV Tropes to do a promo where authors construct story molecules out of the Periodic Table of Storytelling. Since our book is about TV, this was irresistibly funny to us, so we got to take a look at about how Starling fits into that utter time sinkhole that is TV Tropes. We were tempted to do ones for all the fictional shows in the book(s) (Most significantly, but not limited to, The Fourth Estate in Starling and Winsome, Arizona in Doves), but that’s the dangerous lure of TV Tropes right there. Also a danger? When you write scripts and you have to put fake TV in your books. Which ones are good enough to pitch and which ones just prop up your romance novel’s narrative? And what do you do when you possibly start to change your mind? (Winsome, Arizona is a flirt). But all of that is a problem for another day. For now, go enjoy some TV Tropes madness and be sure to check out the other story molecules being hosted this month. This entry was posted in books, Doves, Love in Los Angeles, Starling and tagged books, Doves, lgbt romance, Love in Los Angeles books, m/m romance, Starling, tv. Bookmark the permalink.